Many, many thanks to you all for your prayers, comments, encouragement, blessings, and help as we welcomed our son, Andrew Christopher, into our family last week. God was with us. Everything went smoothly and we are home and settling into life with a newborn! 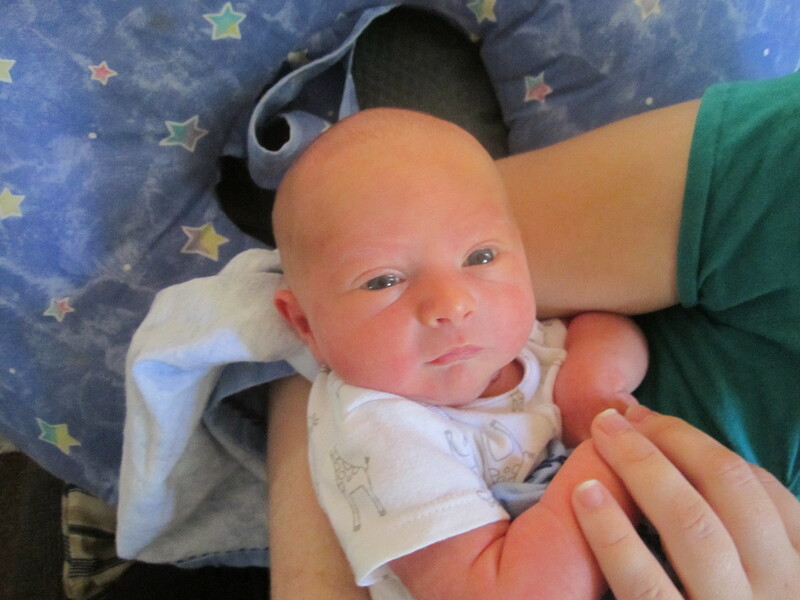 Our son is beautiful, healthy, and such a precious gift. Here’s my letter to him, the last of the letters to my children. Your sister caught me crying over you last night. She feared for me, worried that I physically hurt, worried that I was sad or scared about you. Maybe one day this eight-year-old girl will be a mom watching her own newborn sleep and she’ll understand the tears. I try to explain it to her now…how I’m crying because I’m happy. I blink these tears away or maybe they’ll slip down my cheek as I’m watching your baby facial expressions change, listening to you coo, stroking your tiny pink fingers and toes, running my hand softly over the outlines of your face or the fuzz (can’t really call it hair) on your tiny head, or watching your two deep-sea-blue eyes search the room and linger when you see my face. I’m awestruck. That’s what I am. I’m overwhelmed at you, this tiny bundle of expectation, this incomparable gift of God given to your dad and me and to three wildly excited and proud big sisters. How could God give me a gift so precious, so beautiful? How could He trust me with the care of a son, a boy to teach about Godly manhood and character, courage, strength, passion for God and His Word and truth? Already, you teach me with your days-old wisdom, and I’m learning a whole new world of diapering and outfits and caring for a baby boy. But the lessons, the deep ones that will change who I am as a mom and as a woman, will continue for a long time. You remind me of this grace, so abundant and undeserved, that God heaps on us. It’s salvation plus…..the cross itself, the great miracle of mercy, plus a gift so valuable as you placed in the arms of imperfect me. And isn’t God’s grace always this? The once-for-all rescue for sinners in Christ’s sacrifice and then daily mercies that He lovingly gives us day after day after day…. You teach me that I’m never on my own, and I’m so thankful for the reminder. Maybe if you’d been another girl, a fourth daughter for me, I’d be tempted to think, “I’ve got this. I can do this. I know this…..I…..I…..I. How can I be your mom? How will I know how to train you and guide you? Because God will give me wisdom, strength, all I need. It’s a reminder I see even now, cradling your tiny feet in my hands and stroking your soft, pink baby toes. All these months of knowing I was having a boy, I worried and fretted—how do I connect with him? How do I relate to a boy? How do I love him best? And now I see it in your toes, God’s answer right to me. The way two of my toes on each foot connect together a little differently than most. We’ve always called it “webbed” feet and none of your sisters inherited that from me. Maybe that’s a little message from God to this nervous mom’s heart, that you are mine, specially chosen to be my son, and I have the privilege, the honor, the blessing to be your God-picked, God-designed, exact right mom for you. Your dad and I hold you now in excited wonder, wanting so much to see who God designed you to be and what gifts and talents He’s placed in you. We can’t wait to know you more and more. And we are praying for you. We’ve been praying all along, of course. From the moment we knew you were coming, we held hands in a restaurant, celebrating our anniversary and praying over the news that you were coming. We prayed about your name, wanting it to reflect God’s plan for you. So you are Andrew Christopher…. 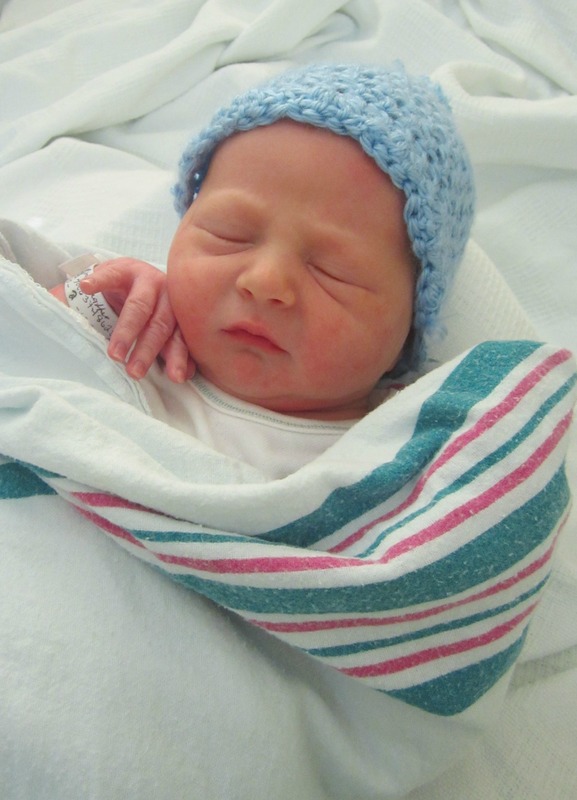 Named for your dad, James Andrew, and named for the first disciple to follow Jesus. In Scripture, Andrew is a pursuer of truth, first following John the Baptist, then following Jesus, and then bringing others, including Peter, to Christ, as well. And Christopher, or “Christ-bearer…” one who brings Christ to others. May it be so. May your witness, your testimony for Him, your character, your love for God and His Word bring others to Christ and Christ to others. These are our prayers for you, our son. Love the precious boy and his welcome love message of greeting to this world and the grace of God upon His young life! Thanks, Ms. Louise! I want to make sure we take the time to bless our children! Thanks so much for the well-wishes and blessings! Congratulations and God bless!! So happy to hear! God is so good! We are so thankful to Him! What a beautiful expression of a Mom’s heartfelt response to her tiny son! God’s grace is truly mind boggling. I love the picture of your uniqueness and your son’s. Andrew is precious and so blessed to have James and you as parents and those adorable big sisters!